I just got back from the store. Did you know the world is ending? Or, at least, that’s how people are acting out there. You’d think they’re calling for a blizzard or something the way people are out there snatching stuff up. We don’t get blizzards here, but I don’t think we got the memo. I had to hit Costco, because we’re almost out of dog food. Folly takes after her mom, so not having food reserves is not an option. (We get hangry.) Then I stopped at EarthFare on the way home to get some ingredients to prep the recipes for my upcoming 14 Day Paleo Challenge. 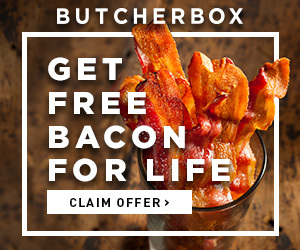 I’m super-stoked about this: it’s 14 days long (obvi) and each day teaches you something new about eating Paleo. It includes recipes, ingredient lists, and prep steps to walk you through cooking and serving an entire Paleo meal, so you can see how easy it really is. Anyway, after that, I had to go to Harris Teeter to get the last few things for the Christmas for the Cops meal this year. We’re setting up a baked potato bar, with ground beef, cheese, sour cream, chives, and olives. It’ll be nice to not be eating chili for the 5th year in a row on Christmas day. After our incredibly relaxed, easy meander across the South, it’s been a reality check coming back to a densely populated area, where people honk and cut you off and jump in front of you in line and all sorts of other fun holiday spirit behavior. Everything is definitely spread out in rural America, but it’s kind of nice – no one’s in a hurry, everyone is kind, and everyone has all the time in the world. Not here. Here, the world is ending and we all must buy ALL THE THINGS before the rest of the population snatches them up. Speaking of how the world is apparently ending, and Christmas day, I’d say the holidays are the perfect time for a cocktail, wouldn’t you? All that frazzled shopping, followed by time with family, sitting around the house – I’m sure we’ll be having a drink or two to maintain sanity. 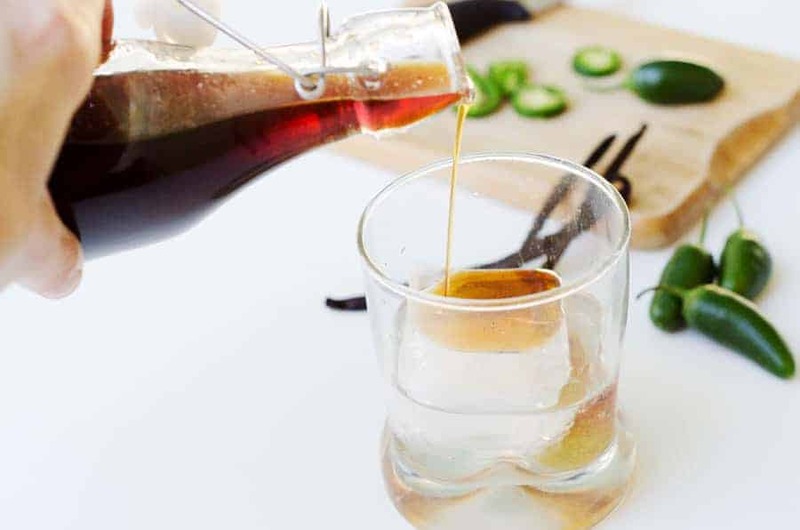 This jalapeño vanilla simple syrup recipe is delish, and will add the perfect spicy-sweet to your holiday cocktail. This recipe is super easy to make. If you don’t have maple sugar, you can use coconut sugar, or even regular sugar if you must – I promise I won’t call the Paleo Police. Besides, when we’re at the point that we’re dissolving 2 cups of sugar in 2 cups of water, I think we’re already off the Paleo rails. Be careful not to put all the jalapeños in at once – you’ll want to reserve some for the end, so you don’t cook off all the spicy heat. The ones you put in after you take it off the stove will give it a little something extra. 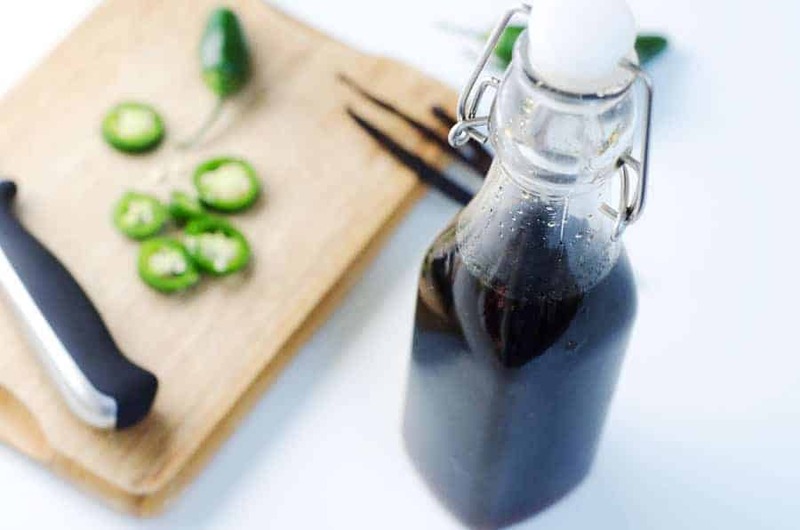 The end result is a smooth vanilla flavor, with a little kick at the end from the jalapeños – not too much, just enough to make the flavor interesting. 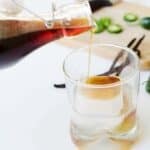 I can tell you from experimenting, this is better in cocktails that use less robust flavored liquors – so, it works better with vodka, gin, white rum. When you get into the bourbons and spiced rums, you’ve got a lot of strong flavors competing, and the simple syrup tends to get drowned out. That being said, experiment and try it out, and let me know if you come up with a DELISH combo! Happy Holidays to you and yours. Hope you make it through with your sanity intact. Cheers! Using a sharp paring knife, split each of the vanilla beans open from end to end. Slice the jalapeños into rings; don't discard the seeds! In a saucepan over medium heat, combine the maple sugar, water, vanilla beans, and 2/3 of the sliced jalapeños (seeds included). Bring to a boil, then reduce heat to medium low and simmer approximately 20-30 minutes, until mixture is reduced by half and coats the back of a spoon. Remove from heat and add the remaining jalapeños to the pot. Allow to cool, then strain through a fine mesh strainer into a resealable jar or bottle. Will keep in the fridge for 2-3 months. 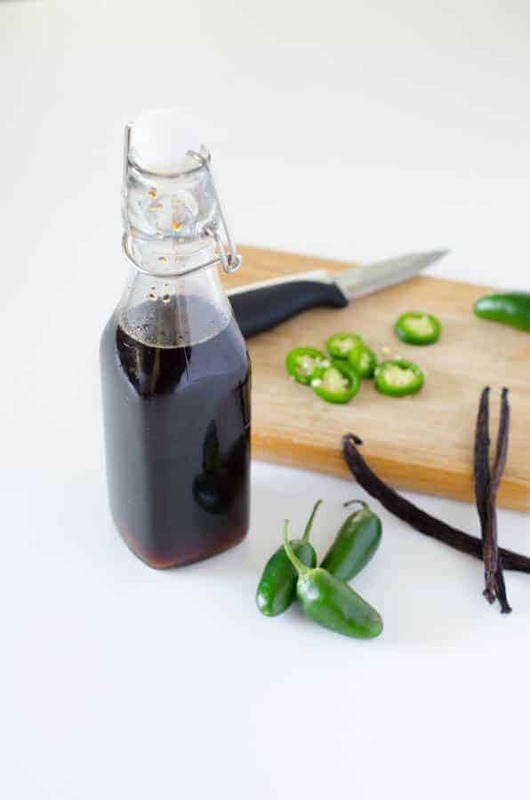 Do you have any beverage recipes using your jalapeno vanilla simple syrup? Hi Jennifer, I’m so sorry, I don’t know how this comment slipped by without me seeing it! I don’t have any recipes using the syrup yet. I do have a big crop of jalapenos in the garden, so I’ll test some out for you! That being said, it is better in cocktails that use less robust flavored liquors – so, it works better with vodka, gin, white rum. When you get into the bourbons and spiced rums, you’ve got a lot of strong flavors competing, and the simple syrup tends to get drowned out. Hope that helps!